Don't let the weather dampen your style. These over-the-knee, cuffed boots are made with waterproof suede and a durable rubber sole so you can live your day-to-day life in comfort and style. 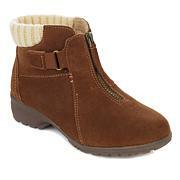 These boots are comfortable and stylish. The fit is ALWAYS spot on with Sporto! 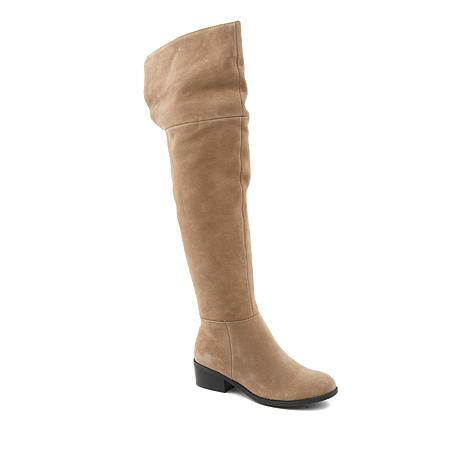 I LOVE that this boot was made as a flat and not a wedge/heel. I bought the Black and may go back for the Taupe color too. I have other Sporto boots that are waterproof suede. Their quality is EXCELLENT. The only thing that I would've liked better, is if the cuff was suede on the INSIDE as well. This way when it's folded down you don't see the lining. It would be more versatile, 2 looks in 1. GREAT boot regardless. 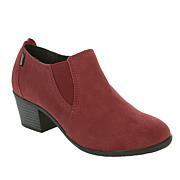 This is a great boot you can dress it up. You can dress a casual they fit the leg well and stay up. Most of all they are soft and comfortable so you can stand up at the party all night. I love the boot fabric is great fit is perfect. These boots are beautiful and possibly the most comfortable ones I've ever purchased. Wider foot bed and perfectly fitting around my calves. Pretty happy with these boots overall. Tall boots tend to not work out for me because my calves are too big. But these fit. The do fall down a bit from over the knee/have to pull them up from time to time while wearing, but I like them. Glad I got them.